The UAE is slowly, but steadily, becoming a cashless society with residents carrying less cash and using more plastic money in order to pay their bills, airfares, hotel bookings and payments for dining out. UAE residents' preference of cards usage over cash increased by 14.8 per cent in 2017 as against 7.1 per cent in the previous year with most of the growth spending witnessed on cards issued by UAE banks. According to a data compiled by Network International, spending on cards issued by UAE banks rose 15.9 per cent year-on-year and accounted for 79.3 per cent of total point of sale (POS) transactions. "The growth in residents' spending has more than doubled in 2017 although some of this increase could be due to purchases ahead of VAT. 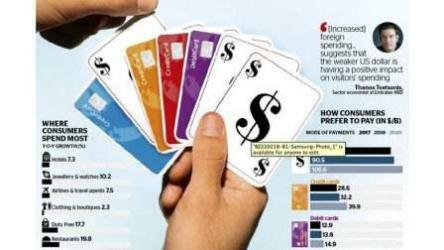 Foreign spending - cards issued by non-UAE banks - also increased 10.5 per cent compared with the 10.1 per cent decline in 2016, suggesting that the weaker US dollar is having a positive impact on visitors' spending," Thanos Tsetsonis, sector economist at Emirates NBD, said in a report quoting Network International and Emirates NBD Research data. "The nominal value of card spending is likely to rise simply as a result of higher prices post-VAT. However, we don't expect household consumption to be a key driver of growth this year. Travel and tourism spending is likely to remain robust given the importance of the UAE as a global air-hub, and the expansion of domestic airlines," said Thanos. Rabia Yasmeen, analyst at Euromonitor International, noted that increasing merchant acceptance, POS terminals in the UAE and discouragement of charging transaction fees to customers are some basic underlying reasons that are driving the improved card spending in the UAE. According to Euromonitor estimates, consumer payment transactions in the UAE reached $128.8 billion (Dh216.53 billion) in 2017 and will grow to $136.5 billion in 2018 and $160.4 billion in 2020. Credit card transactions reached $28.6 billion in 2017 which are forecast to increase to $32.2 billion in 2018 and $39.97 billion in 2020. Similarly, debit card transactions totalled $12.96 billion in 2017 which are forecast to grow to $13.88 billion in 2018 and $14.98 billion in 2020. "While card spending is increasing, this is directly reflected in decline in cash payments made in the country, which has declined by four per cent during the previous year. Over the forecast period, card payment transactions are expected to grow by an average rate of seven per cent by 2022. Online payments are grew by 19 per cent during the year, which form 13 per cent of the total card payment transactions in the country," she added. She opined that payments of bills, transport such as airfare, retailing and hotel bookings and restaurants are the key areas UAE residents are using their card spend on. She pointed out that reward based platforms, discounts and lifestyle privileges and discounts earned when paid through card have led to increasing card payments. "We observe that the number of card payment transactions is increasing faster as more consumers use cards for day-to-day transactions including transport through taxis. Moreover, 2017 also saw Apple Pay and Samsung Pay launching their services in the UAE. In terms of overall spending by sector, the Network International and Emirates NBD Research report revealed that restaurants enjoyed double-digit spending growth for a third consecutive year in 2017, accounting for 15.9 per cent of total card spending. UAE residents increased spending on restaurants nearly 20 per cent year-on-year while foreign spending on restaurants was also up 19.4 per cent annually for the same period. Duty free sales and airlines and travel services also enjoyed strong growth of 17.7 per cent and 7.5 per cent y/y in 2017, respectively. The robust growth in spending in the travel and tourism sector highlights the increased importance of the UAE as a global air hub, and the expansion of domestic airlines. Foreign spending growth, however, suggests that Dubai's attractiveness as a tourism destination has improved in 2017, with expansion in visitor spending in most categories except clothing and boutiques. The robust rise in foreign spending on airlines and travel agents highlights the emirate's importance as a global transport hub. The top foreign spenders in the UAE last year were those from the US, Saudi Arabia, the UK, Russia, China, Kuwait, India and Germany.